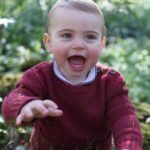 Today the Spanish Royal Family was out in full force to support and recognize the sports in Spain. 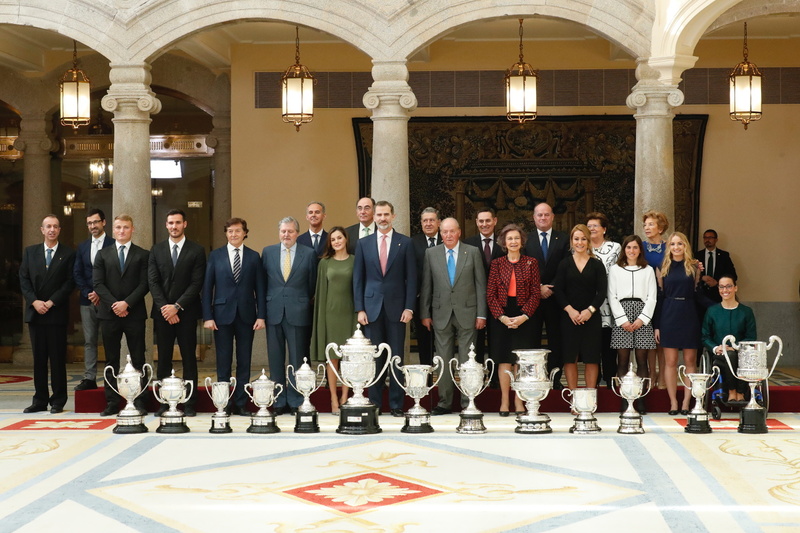 King Felipe VI was joined by his wife Queen Letizia and his parents King Juan Carlos and Queen Sofia for the delivery of National Sports Awards 2018 at the Royal Palace of El Pardo in Madrid. 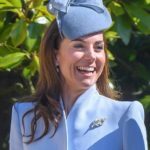 The Royal Family was welcomed by the Minister of Education and President of the Council at the Patio de los Borbones of the Royal Palace of El Pardo. The awards are granted by the Higher Council of Sports to recognize persons or entities that, either his direct activity or personal initiative, as well as participants in the development of the sports policy, have contributed in an outstanding way to promote or spread the physical-sport activity. 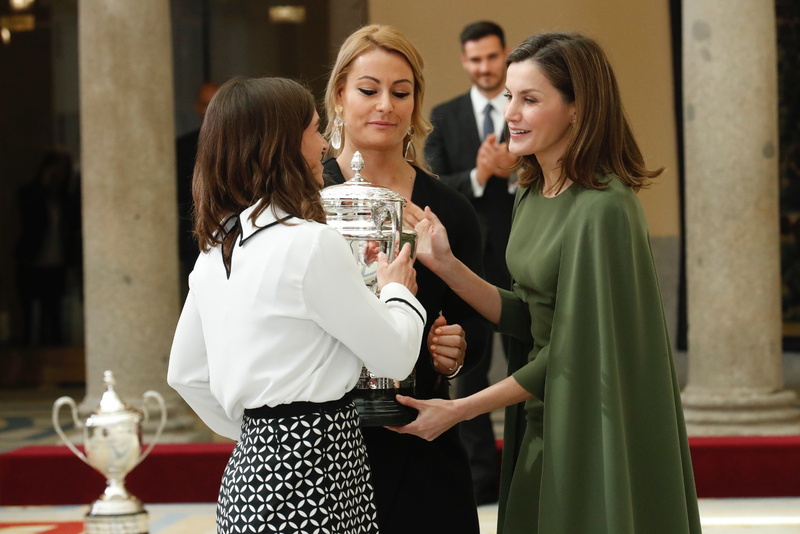 The award presented today in individual category were King Felipe Award, Queen Letizia Award, Rey Juan Carlos Award, Reina Sofía Award, Princess Leonor Award, Infanta Sofía Award, Iberoamerican Community Trophy. The team awards were Copa Barón de Güell, Stadium Cup, Superior Sports Council Award, Joaquín Blume Trophy National Award for the Arts and Sciences Applied to Sport and National Award Francisco Fernandez Ochoa. After the ceremony Kings and Queens greeted and congratulated the award winners. 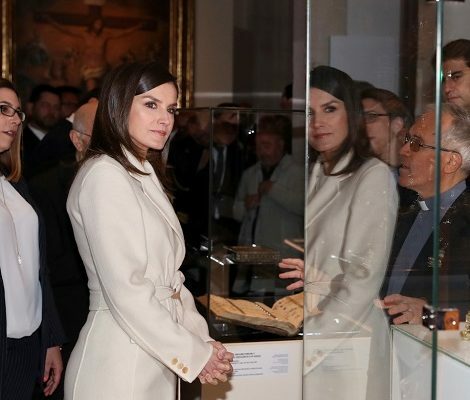 For today’s ceremony, Queen Letizia brought the mysterious still unknown cape dress back. 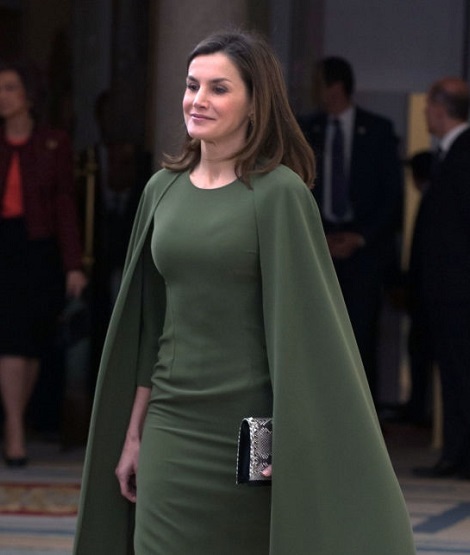 The olive green knee-length shift dress with a same length cape was debuted in February 2017. 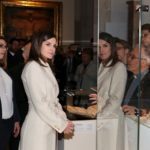 Letizia paired the outfit with Magrit’s animal printed python leather pumps with studs at the front and back. Queen also carried the clutch from Magrit having same design and pattern as the pumps. Both pieces are custom made. 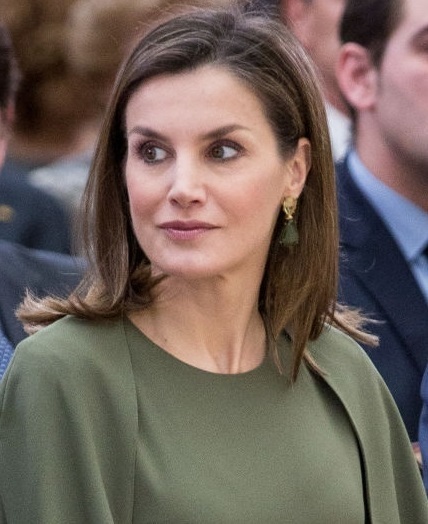 Letizia finished her look with a new pair of earrings. The label of large Citrine and Peridot gem earrings in teardrop shape is still unknown.